Italian niche line Bois 1920 has launched three new fragrances for women under the name Le Voluttuose: Kimono Rose, La Vaniglia and Notturno Fiorentino. Kimono Rose (shown) ~ "Kimono Rose is a homage to femininity and sensuality. The rose, a symbol of love and timelessness, plays the main role in this fragrance." With notes of bergamot, mandarin, blackcurrant, lychee, Bulgarian & Turkish rose, lily of the valley, bamboo, cedar, iris, patchouli and ambergris. La Vaniglia ~ "Vanilla, one of the most popular essences in perfumes, is found here in an exclusive symphony with fruity, fresh and warm nuances. An olfactory masterpiece that meets the needs of women who appreciate such special perfume creations." The notes feature bergamot, mandarin, mint, pepper, ginger, frankincense, patchouli and vanilla. Notturno Fiorentino ~ "The new fragrance Notturno Fiorentino by Bois 1920 is surrounded by a mysterious mystique and aura, and every man who smell it will never forget the woman who wore it ..." With bergamot, black pepper, jasmine, rose, blackcurrant, vanilla, white musk, cedar and tonka bean. Isn’t Kimono Rose the exact name of a frag from Thymes? Yes. Don’t know if either company has trademarked the name though. Hmmm. Very disappointed with that pink bottle – I thought the latest gold-flecked bottles were pretty cool. As I’m a fan of their fragrances, I’ll probably try these, though maybe not the rose. The other two sound interesting. The gold bottles are lovely! I like these too though. Oh, La Vaniglia sounds strange and interesting. I’ve done some recent obsessing over frankincense and that, plus vanilla sounds delicious (oh, and ginger! )…though the mint sounds a little out of place, if done right (like it is often in cuisine) it could add a cooling herbaceous note to tone down the warmth of it all. Yep. I’m hesitant to try them because of that very reason. My ‘easily over $100’ want list is already frustrating enough. I agree – that La Vaniglia combination sounds intriguing! It does, doesn’t it? I was turned off by the word “fruity”, but read further and it actually doesn’t sound very fruity at all. I like the line, though as Robin said, it’s not a bargain. I do recommend Sushi Imperiale (my other like is Vento di Fiori). Okay, I want to try these. They all have one or two interesting notes (mint and ginger in La Vaniglia, the black pepper in Notturno Fiorentino). How are the brand’s other fragrances? I really like Come la Luna. I got a bottle on *bay from a young lady in Italy. Initially she said she had sold but asked if I were still interested. Then — whaddaya know? — she had one the next day! It came, marked “tester NFS.” Every time I look at the bottle I wonder if she got the five-finger discount. Love the frag, though and the Nottorno sounds interesting. Oh dear, I hope these make it to the U.S. this Fall. 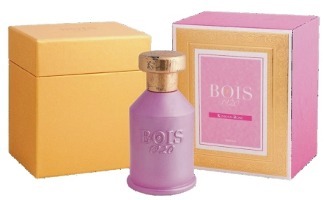 I adore a few fragrances from the Bois 1920 line, so I’m eager to try these. oh ah ha! i don’t want to spark any more lemmings, but…..i’ll send you a couple of samples to try! Love vanilla, so really hoping to love Vaniglia (or maybe hate is the more responsible reaction to hope for at this pricepoint? ), although Notturno Fiorentino sounds very interesting as well. I need to try kimono rose. Due to the price I cannot just splurge and regret later. I live in NYC, does anybody knows where can I sample this? ps: I just found this blog and have been reading for hours non stop. I am hoocked! Avery might be carrying it. Otherwise, I think you’d have to buy a sample online.